The first step is to turn off the refrigerator and empty the contents of the freezer into cooler bags or a cooler of some kind. Since these things will be out of the freezer for just 20 minutes, they won’t defrost and the ice cream won’t melt. 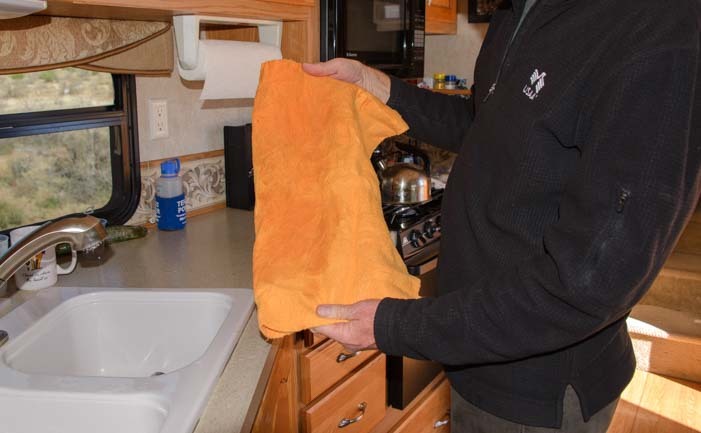 If your RV is hot inside, covering the cooler bags with blankets for extra insulation can help. We used to unload the whole refrigerator and empty it out completely, but that isn’t necessary and it takes a lot of time. An awful lot of what is in the refrigerator can handle warming up slightly as you keep the refrigerator door open to defrost it. Instead, just unload the most temperature sensitive items — milk, yogurt, lunch meats, mayonaise, etc., into an insulated cooler bag or a cooler. Most of the fruits, veggies, bread, cheese, condiments, etc., can remain right where they are in the fridge for the 20 minutes it takes to defrost it. Set the cooler bags aside. Covering them with blankets will keep everything even cooler. 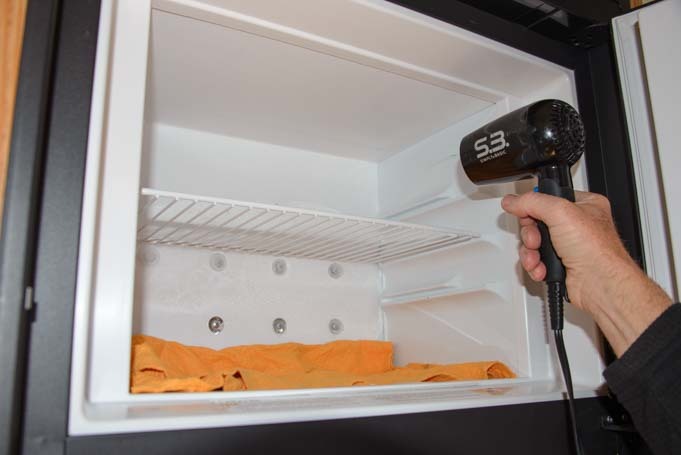 Next, put a super absorbant chamois towel in the bottom of the freezer compartment to absorb the water from the melting ice, and use a hair dryer to thaw the walls of the freezer. 9:22 a.m. – Use a hair dryer to thaw out the freezer. We live exclusively on solar power, and our 2,000 watt pure sine wave inverter is what powers all our AC appliances, including the hair dryer. So, we have a low wattage travel hair dryer that draws just 800 watts (available here). We put it on the high setting and keep a distance of about 8″ between the hair dryer and the walls of the freezer. A higher wattage hair dryer may need to be put on the low heat setting. Hold your hand about 8″ from the hair dryer and see how hot it feels. Be sure you keep the hair dryer from heating up the plastic walls or they will crack from being cold and then getting hot. Keep the hair dryer moving and test the temp of the plastic walls with your hands. 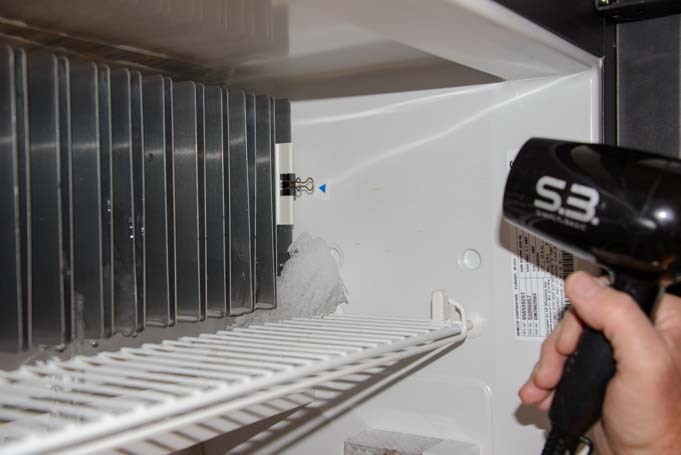 After thawing the walls of the freezer a little, move down to the cooling fins in the refrigerator compartment. Keep the hair dryer in constant motion, sweeping it back and forth from side to side. Slowly wave the hair dryer in front of the cooling fins. Alternate working on the freezer compartment and the refrigerator compartment. Alternate between the cooling fins in the refrigerator compartment and the freezer compartment. 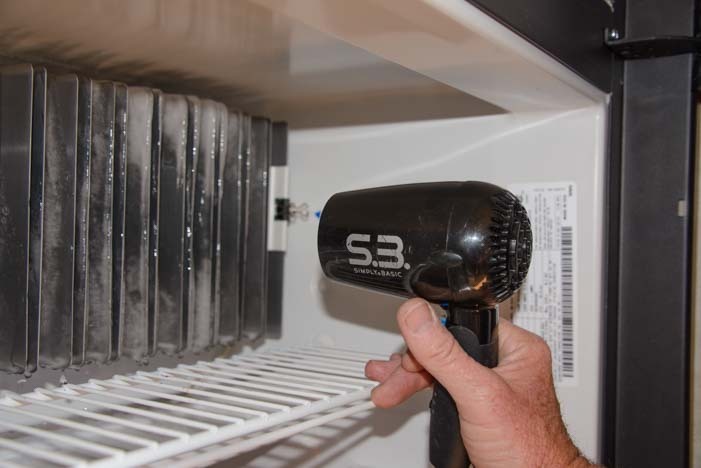 At the beginning, when the cooling fins are caked in ice, the hair dryer can be closer to them. 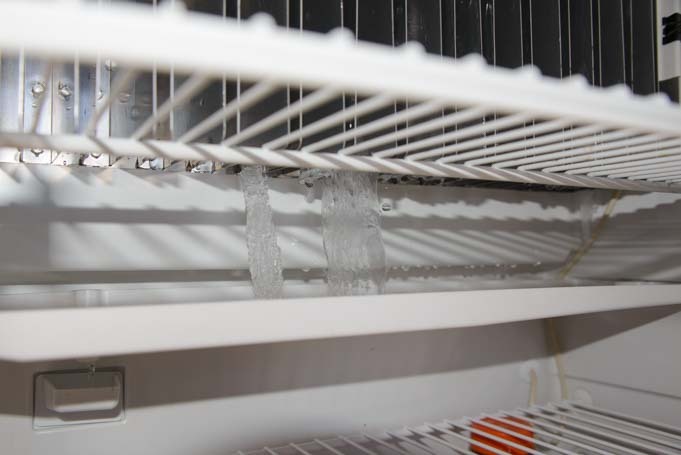 Little ice sheets will begin to fall off the refrigerator cooling fins into the drip tray underneath. As the thawing process continues, increase the distance between the hair dryer and the cooling fins. As ice drops and the cooling fins thaw, move the hair dryer back a little. Don’t chisel the ice off the fins or the freezer walls with a tool. 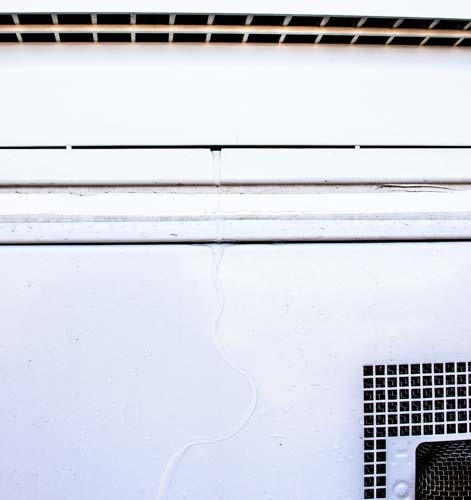 If you pierce the metal base behind the cooling fins or the walls of the freezer, the refrigerant (ammonia) will leak out. We don’t use any chiseling device. We simply assist the thawing process with the hair dryer. Check beneath the cooling fins and you’ll see the bits of ice dropping into the drip tray. Check below the cooling fins where the ice drops off in chunks. 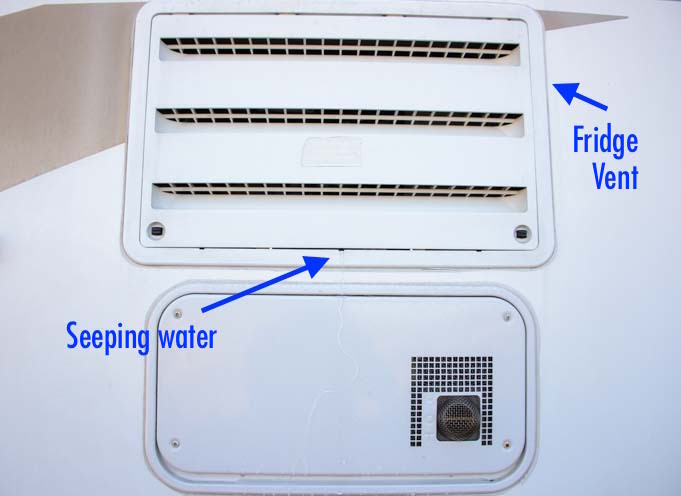 If you go outside, on the back of the RV you’ll see water seeping out of the refrigerator vent. Outside the rig, water will be seeping from the refrigerator vent. A little trickle of water flows down. Once all the ice has fallen off the cooling fins, pull out the drip tray and dump the ice in the sink. 9:34 a.m. – Once all the ice has dropped off the cooling fins, empty the tray of ice into the sink. Up in the freezer compartment, the chamois towel is now fairly wet with water that has dripped down off the walls. Wring it out and use it to wipe down the freezer and the fridge. 9:35 a.m. – The chamois towel in the freezer is pretty wet. Use it to wipe down the fridge and freezer. 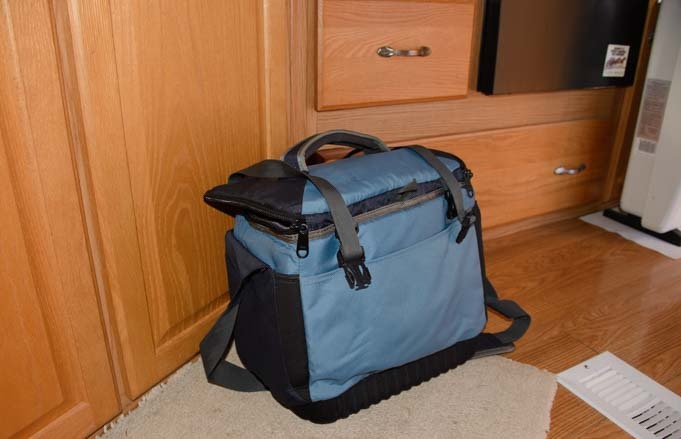 Load the food from the cooler bags back into the refrigerator and freezer compartments, and you’re done! Put the fridge at max temp for a few hours to help it cool back down, and then set it to the temperature setting you normally use. 9:37 a.m. – After loading the food back in the refrigerator, turn it back on. Done! 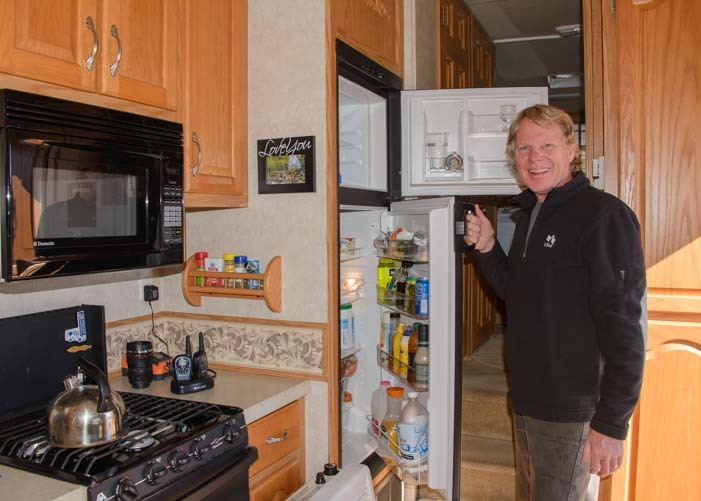 The key to having an RV refrigerator work optimally is having the air circulate inside well. Overstuffing the fridge with food makes this difficult for it. 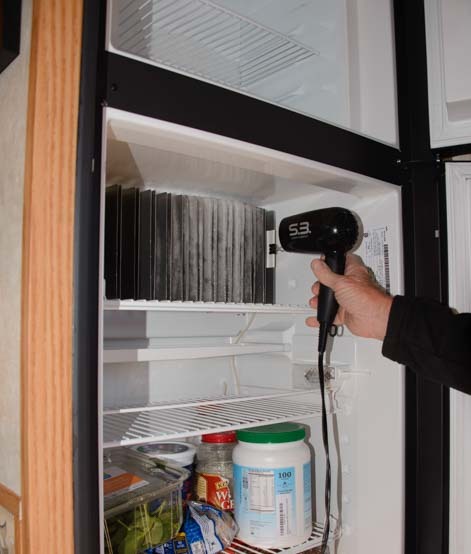 We have used a little RV refrigerator airator fan that’s designed to keep the air flowing. We’ve had mixed results with this, and when it died we didn’t replace it. I think this would work well if there were space between all the food, but our fridge is usually packed (the turf wars between the beer and the veggies can be brutal…sometimes we can hear them battling it out in there!). As a maintenance item, we keep the door seals clean, wiping them down periodically. We use simple refrigerator thermometers to monitor the temperatures in the fridge and freezer. It has a built in hook, and we hang it from one of the rungs in the top shelf in the refrigerator. The one in the freezer rests against one wall. 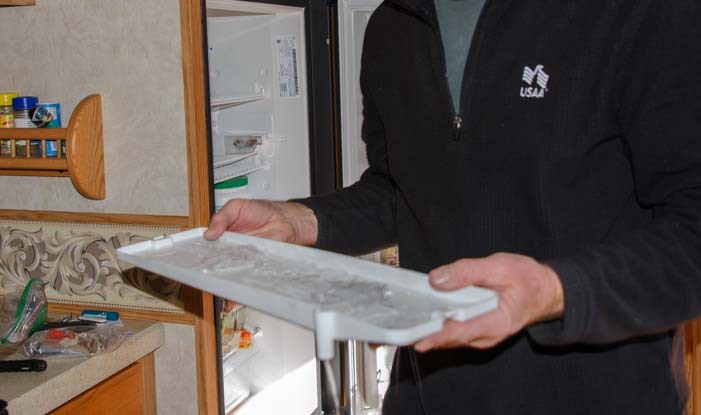 We were surprised to learn that RV refrigerators have an expected lifespan of about 8 to 10 years. A classic sign of impending failure is the appearance of yellow dust in the refrigerator vent area behind the fridge (go outside and take the vent cover off and look around with a flashlight). 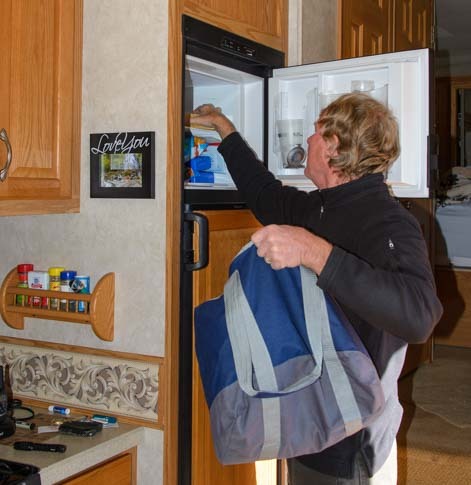 Click the following link to read the funny story of our RV refrigerator replacement and see how an RV fridge replacement is done. Because of the shorter lifespan, higher price, and use of propane in RV refrigerators, many (most) “full-time” level fifth wheels and motorhomes are now being built with residential refrigerators that run on AC power only (a dedicated inverter is installed so it can run from the batteries while in transit). For folks that have plans to dry camp and boondock a lot in their RV life, a residential refrigerator will require a much bigger battery bank and solar panel array than would otherwise be needed. We discuss that in more detail at this link in our introductory solar power article. 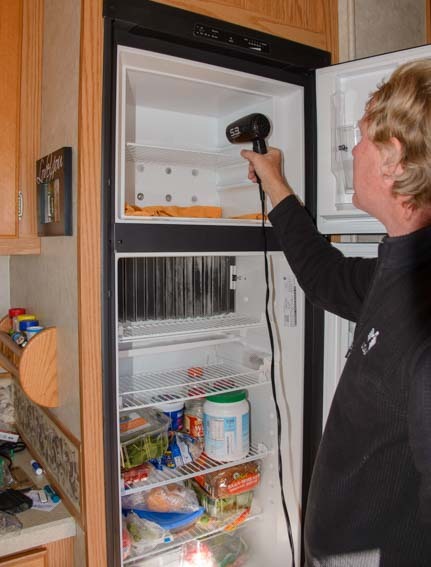 If our hair dryer method of defrosting an RV fridge seems unorthodox to you, believe me, we have tried many other methods. We tried opening the fridge and freezer doors and letting the fridge thaw out on its own. We tried doing that and “helping it along” by chiseling the ice off with a small plastic scraper. We tried putting a bowl of hot water in the fridge to help it warm up. All of these methods were adequate, but they were time consuming. We’ve been using our current method with the mini travel hair dryer for a few years now and really, really like it. Those darn turf wars. Giving them all more turf with an electric cooler must help a lot, lol!! Especially be careful and NOT use an ice pick or any other sort of implement to remove the ice. You poke a hole and you can cause a leak and it can be very dangerous. The ammonia (NH3) refrigerant is an anhydrous ammonia, its of such a purity (its not at all like the stuff you can buy in the store) that it can be explosive and flammable and the gas vapors itself are dangerous. The one thing that we have on our side is that these ammonia absorption units have a small amount of ammonia in it, but a cloud of vapor can explode in a small fire ball even with just a small amount of ammonia if exposed to open flame or spark. Ice cream plants use anhydrous ammonia for their refrigeration and freezing and every once in a while a leak can occur and explosion can level the place! Thank you for reiterating the warning, and especially for the details why!! seamless tubed [better than the OEM tubes] remanufactured pre-charged ‘guts’ are available on ebay for most RV refridgerators, and new ‘guts’ are available for ones not having rebuilts for alittle more……..installation is not complicated and no special tools are needed………..price is 1/3 the cost of whole new unit installed by a dealer [unless one has door to window RV insurance!]. now i’m going to go have my fun looking at horse bend in the picture part of this installment……after i’m jacked up, then add a shelf to expand the house battery bank in our ‘new to us’ class A shortie. Thanks for the tips! The warranty option is a good one too since it covers a lot more than just the fridge. When our RV fridge died, our RV warranty covered the replacement completely with just a $100 deductible and now we have a brand new fridge… (more info here). Only thing I would disagree with is the setting of the thermostat high and coming back to lower, if it is working it will work hard at getting it to right temp you set. I installed an outdoor thermometer’s remote probe into the refrig just below the coils just to get peace of mind that it is working. Yup, vacationers are lucky not to have to deal with defrosting these things, that’s for sure! Our logic is that the fridge will cool down faster if set to “max cold,” but it will definitely get cold either way, and it may or may not be faster. With everything in this lifestyle, do what you feel is right for you!! Tried your method – worked wonderfully!!! Did discover yet another problem with this new Heartland Pioneer – the runoff (to the outside) doesn’t work well. Had a small stream coming out of the bottom frame of the fridge – which unfortunately is right above the fuse panel!! Had me hopping to mop as fast as I could. Kept up, no panel issues, but that sure intensified the experience!!! Thanks for posting your method!! Worked great!! I’m so glad to hear that it worked for you, Nore. Too bad about the drainage and fuse panel location on your Heartland Pioneer, but at least you caught it in time and won’t be surprised next time! !